“Brilliant”, “Outstanding”, “Abysmal”, “Pathetic” – do these sound familiar in your workplace, especially in meetings? Welcome to the domain of superlatives and the world of management by adjectives. As the corporate world chugs along, trying (and failing) to keep pace with the lightning speed with which social media proliferates all aspects of life, every adjective that is (and is not) in the dictionary has become a weapon in the management arsenal. Of course, pundits have long acknowledged and recommended the positive power of a pat on the back of a deserving employee. But, surely, isn’t a response of “awesome” from a manager while acknowledging his secretary’s mere mention of his next appointment a bit of overkill? Or an exclamation of “phenomenal” upon hearing a co-worker mention that the earth is round? While the novice manager tries to be merely sensational with her use of adjectives (in the absence of any meaningful objectives), the professional takes the act to a different level – strategy at its best. With a deft maneuvering of the topic with the right adjectives, a situation such as, “We messed up and lost the order” could be portrayed as, “It was a sensational battle that came down to the wire. The competitor was selling snake oil with smokes and mirrors and unfortunately the customer failed miserably to see the extraordinary value in our unprecedented offer”. Dan (CEO): How is the new building coming along? Bob (Head of Construction): We have had some serious setbacks. Material for the structures arrived very late and the building crew had to be reassigned many times and we are six weeks behind schedule. Mary (Head of Purchasing): Dan and Bob, it has been a hectic time with all vendors due to the unforeseen, unseasonable weather. My Senior Procurement Manager, Liz, has spent countless number of hours relentlessly chasing up an endless number of sources and has made the supreme sacrifice of canceling her precious dental appointment. But for dedicated staff like Liz, we would be way more behind schedule. I am monitoring the situation 24/7 (24/7 is an adjective not in the dictionary). Dan: OK, ok…. Both of you, please get this back on track. Check this out for ‘political’ entertainment that seems to rival and, often beat, corporate humor. 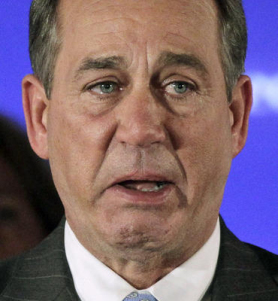 Outgoing Speaker John Boehner is just so happy that he won’t have to do this crappy job anymore. A couple of weeks ago, Republican John Boehner, Speaker of the House of Representatives, announced his retirement, and this Thursday the Republican party was scheduled to have a closed party election to fill the position. However, the election has been indefinitely postponed. Supposedly, the reason for delay was that the House Majority leader Kevin McCarthy, who was widely expected to win the election, unexpectedly withdrew from the race yesterday: McCarthy had admitted that the purpose of Benghazi investigations was to lower Hillary Clinton’s poll numbers, and this unfortunate episode of truth-speaking called McCarthy’s political competence into question. However, this wasn’t the only reason, and here are 10 other reasons why the vote was postponed. 1) Every Republican politician who could have been interested in the Speaker job is already running for president. The term Consultant is such an integral part of the corporate world – invoking, at the same time, images of a monster, a smooth operator, a scapegoat, a panacea for all evils or a tail-spinning artist depending on your point of view – that it deserves to be treated as a phenomenon rather than a mere noun. First, who IS a Consultant? While we can fill several volumes with definitions and narratives, let us, for the sake of simplicity, treat the Consultant as an ‘outsider’ who is hired to accomplish a task that the parent organization in unable or unwilling to do with its internal resources (phew, that was hard!). A Consultant usually makes his way in as an expert in something. The first thing that he does to establish his expertise is to question if the problem that he is hired to solve is indeed as simple as the novice organization initially thought it to be. “Do you think this is simply a technical problem of linking all your computers together in a network? Have you thought of access controls? How would you protect the (fictitious) personnel data (that is not present on these computers) from unauthorized changes? Where is your audit trail?” and many more questions are thrown at the unsuspecting managers unfortunate enough to be selected to work with the Consultant. Very quickly, matters spin out of control and a one-week assignment for one Consultant becomes a multi person-year program, complete with an in-house office set up for about hundred staff members from the Consultant company. A series of meetings then follows to define the problem. “But, we already stated the problem in our original engagement letter” pleads the IT Manager with a quiver. She is quickly brushed aside by the Senior Partner from the Consultant company who is armed with a 55-slide presentation on the steps for scope definition. It becomes rapidly evident to the parent organization that they do not have any of information required by the Consultant to define the assignment. Several dozen in-house programmers are pulled from their critical work to extract and analyze data from various databases – ranging from number of copies of applications running on various servers to the first names of spouses of employees who left the company in the past 50 years. In the meanwhile, all the Consultants (yes, there are dozens of them by now) are preparing the next set of questions to be answered. Six months and several million dollars later, there is the expected management review of what (the hell) is going on. Needless to say, it is the Consultant(s) who is presenting the status, as everyone in the parent organization has become a dumb bystander in the project. There is a bewildering array of colors – green, yellow, orange, pink and variations thereof – representing the current state of several hundred activities, none relevant to the original assignment. The CIO who is chairing the meeting asks his Director, “What are we trying to achieve here?” The Director starts to mumble, “I think….. I mean…..we started ……” when the Partner from the Consultant company smoothly chips in with, “Respected CIO, that is the topic for our next meeting at 10 AM on Monday next week”, bringing to an end yet another valiant attempt by the parent organization to retrieve itself from the maze.